A fresh twist on a classic favorite. The parmesan breading is delicious. The fresh lemon wedge gives it a light taste enhancing the wonderful flavors. Set out three plates and a lightly greased baking sheet. Put flour in the first plate. Beat eggs and dijon in the second plate. 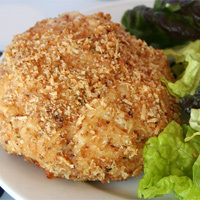 Mix parmesan, bread crumbs, salt, and pepper in the third plate. Set the baking sheet aside to use for the breaded chicken. 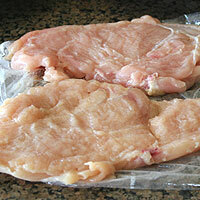 Place one or two breasts in a plastic bag. Pound each 1/4-1/2 inch thick. I like to prep the ham and cheese and the pan before dealing with the chicken. It makes less of a mess and I don't have to worry if chicken juice got on the ham package. Be careful not to pound holes into the chicken. It makes it harder to form and it won't look as nice. If you do have holes keep forming it and pushing it together. 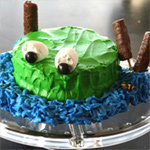 Try to pound it to an even thickness this makes it easier to form and it will bake more evenly. Make them an even thickness throughout so they will cook evenly. Repeat with remaining chicken. 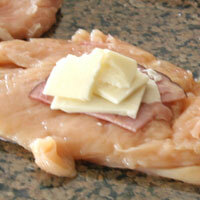 Layer a few slices of ham and cheese on the chicken. Cover with a few more slices of ham. Bring all sides together and seal by balling it in your hand. It may seem like it won't hold together but keep working it into a ball, and it will stay. Coat completely in flour, shake off any excess. Dip in egg mixture and coat thoroughly. 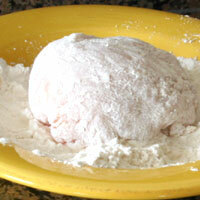 When breading chicken, it is good to coat it in flour before the egg mixture. 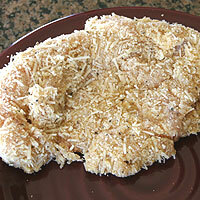 It soaks up any extra moisture from the chicken and the egg and breading will adhere better. Dip in parmesan mixture and get as much of the mixture to stay on the chicken as possible. Place on a greased baking sheet and continue with the remaining pieces. If you are preparing this ahead of time wrap the baking sheet in plastic wrap and refrigerate up to a few hours ahead as long as the chicken is still very cold. Bake for 40 minutes or until cooked all the way through. Serve with a lemon wedge to use on rice, lettuce, and chicken. To make the chicken without the filling. 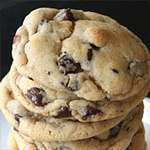 Follow the same instrucitons but don't fill, and cover both sides with the flour, egg, and parmesan mixtures. Heat 3 tablespoons of olive oil in a large skillet over medium/high heat until hot, but not quite smoking. (2)Heat an additional skillet over medium heat. Place two chicken breasts in the hot oil and sear for 1-2 minutes until golden brown. Turn each piece and sear another 1-2 minutes. Spray the second pan with cooking spray. Transfer the chicken to this pan and lower heat to low/medium. Place the lid on and finish cooking (about 5 minutes). Add 3 tablespoons oil to the first skillet. Sear the second batch of chicken on both sides. Lower heat to low/medium. 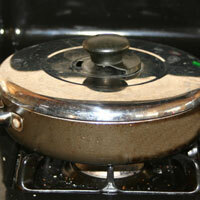 Place the lid on and finish cooking. Use two skillets if making the variation so they can all be cooked and hot at the same time. If you have a very large skillet you can of course just use one. 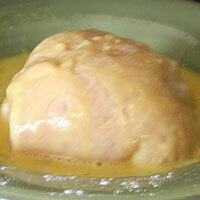 Chicken opening in the oven: Form the chicken into a ball. Work it until it holds a pretty good shape. Continue on with the flour, egg, and breading. By the end of this process it should hold a good shape. 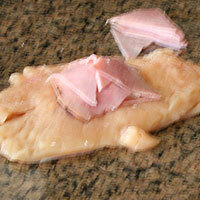 If the ham slices aren't sliced and scattered around the middle it can also open the chicken during cooking. 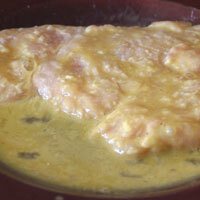 Oozing cheese: Enclose the cheese in the ham, so it won't ooze out any tears in the chicken. 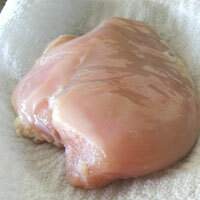 Tears in the chicken: It is hard to pound chicken thinly without creating some holes. Be gentle, but if there are holes try to close them when shaping and cover them well with the coating. 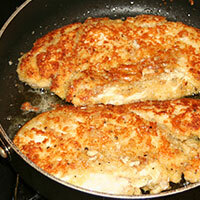 Overcooked chicken: Pan fried chicken can overcook and become very dry. Sear at a medium/high heat and finish at a low/medium heat. It cooks fast, so don't leave it unattended for long. Deep fried taste: You don't want the chicken to taste deep fried. Don't use too much oil, or heat it too high. 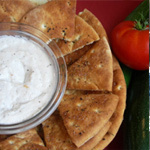 Use olive oil as is called for in the recipe, for a fresher taste than vegetable oil would give. 1. Heat oven to 350. Set out three plates. 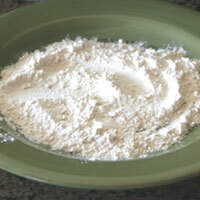 Put (1)flour in the first plate. Beat eggs and dijon in the second plate. 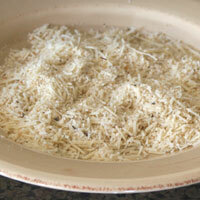 Mix parmesan, bread crumbs, salt, and pepper in the third plate. Spray a baking sheet with cooking spray and set aside. 2. 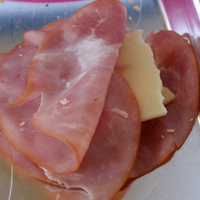 Wrap 1-2 slices of cheese in the ham and (2)set aside. 3. Rinse the chicken and pat dry with paper towels. Place one or two breasts in a plastic bag. (3)Carefully pound each 1/4-1/2 inch (4)thick. Repeat with remaining chicken. 4. 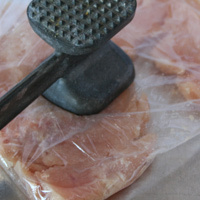 Lay the first chicken breast flat. Place the ham and cheese packet on top of the chicken. Ball the chicken in your hand by bringing all the sides together and sealing it at the bottom. It may seem like it won't hold together but keep working it into a ball, and it will stay. Coat completely in flour, shake off any excess. Dip in egg mixture and coat thoroughly. 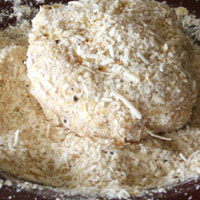 Dip in parmesan mixture and get as much of the mixture to stay on the chicken as possible. Place on the greased baking sheet and continue with the remaining pieces. They are ready to bake at this point or can be covered and refrigerated up to 24 hours in advance. 5. Bake for 40 minutes or until cooked all the way through. 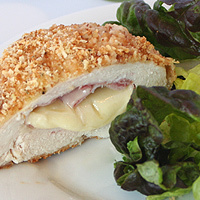 This is simplified, delicious variation of the cordon bleu. 1. Follow the same instructions but don't fill with ham and cheese. Coat both sides with the flour, egg, and parmesan mixtures. 2. Heat 3 tablespoons of the olive oil in a large skillet over medium/high heat until hot, but not quite smoking. Heat an (5)additional skillet over medium heat. Place two chicken breasts in the hot oil and sear for 1-2 minutes until golden brown. Turn each piece and sear another 1-2 minutes. Spray the second pan with cooking spray. Transfer the chicken to this pan and lower heat to low/medium. Place the lid on and finish cooking (about 5 minutes). 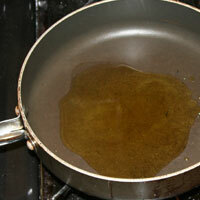 Add 3 tablespoons oil to the first skillet. Sear the second batch of chicken on both sides. Lower heat to low/medium. Place the lid on and finish cooking turning once. 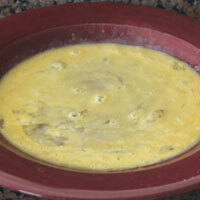 In a medium saucepan over medium heat add the butter, cream, and chicken broth. 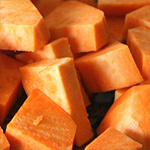 Stirring constantly, bring to a boil and immediately reduce the heat to a simmer. Simmer to reduce the liquid for ten minutes still stirring constantly. Add the parmesan and salt. Stir until parmesan is melted. 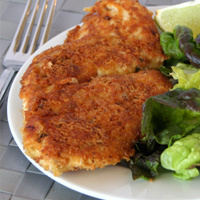 Prepare each plate with one chicken breast, 3/4 c rice, and 1 ½ c lettuce. Place a lemon wedge on each plate to use on the rice, lettuce, and chicken. Serve with extra parmesan, salt, and pepper to pass around the table. 1. 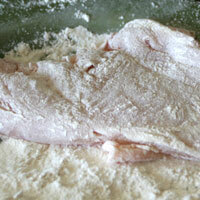 When breading chicken, it is good to coat it in flour before the egg mixture. 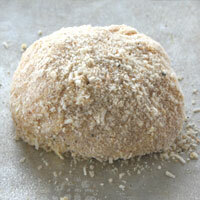 It soaks up any extra moisture from the chicken and the egg and breading will adhere better. 2. I like to prep the ham and cheese and the pan before dealing with the chicken. It makes less of a mess and I don't have to worry if chicken juice got on the ham package. 3. Be careful not to pound holes into the chicken. It makes it harder to form and it won't look as nice. If you do have holes keep forming it and pushing it together. 4. Try to pound it to an even thickness this makes it easier to form and it will bake more evenly. 5. Use two skillets if making the variation so they can all be cooked and hot at the same time. If you have a very large skillet you can of course just use one.